Americas gateway to the universe. Leading the world in preparing and launching missions to Earth and beyond. 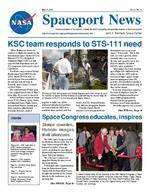 May 17, 2002John F. Kennedy Space Center Spaceport Newshttp://www-pao.ksc.nasa.gov/kscpao/snews/snewstoc.htmVol. 41, No. 10 Page 8  Environmental and Energy Awareness Week draws employee interest. Pages 4  KSC supports student ROV competition. Pages 2-3  KSC team wins at FIRST World Competition, lawmakers honored, Bill Helms retires and Energy Champion named in Recognizing Our People. Page 5  Students enjoy Space Day and more. (See SPACE, Page 6) Inside Page 7  Prepare now for hurricane season.KSC team responds to STS-111 needSpace Congress educates, inspires(See STS-111, Page 4)Station downlink, Hubble images thrill attendeesA ribbon cutting kicks off the opening of the 39th Space Congress in Cape Canaveral. From left are Space Congress Chairman Walter Yager; Mayor Rocky Randles of Cape Canaveral; U.S. Rep. David Weldon; Brig. Gen. Donald Pettit, commander of the 45th Space Wing; and KSC Deputy Director Jim Jennings. When Endeavour leaves the confines of Earth this month for the International Space Station (ISS) on Mission STS-111, designated Utilization Flight 2 (UF-2), it will carry the fifth Expedition crew, an ISS component and several science experiments. It will also carry a critical Orbital Replacement Unit (ORU) for the Space Station Robotic arm  a wrist/roll joint that was added to the mission with the help of Kennedy Space Centers Launch on Need Team. The team had only 43 days prior to the original launch date of May 2 (now May 30) to react to the need. NASA and their contractor teams across KSC, Johnson Space Center and Marshall Space Flight Center, International Partner Canada and their contractor, MacDonald Dettwiler Robotics, worked together to make sure all the analytical and physical products associated with the ORU were available when needed, said Jose Nunez, KSC ISS External Carriers lead, Mission Integration Branch. Usually a Space Shuttle missions crew and payloads are determined over a year in advance, Nunez said.  But in this case, we took a process which normally takes over a year to develop and carried it out in less than two months, all within NASAs safety guidelines. What makes the events leading up to Flight UF-2 different from others is that the ORU, with its associated flight support equipment (weighing more than 540 pounds), was installed vertically at the pad on a sidewall carrier only 22 days before launch. To do this, Nunez first turned to the team of engineers from the Advanced Engineering Environment (AEE) program and the Payload Carriers program for assistance in real-time simulation. The AEE engineers use a virtualWorkers at Pad 39A prepare the Orbital Replacement Unit (wrist/roll joint) for transfer to Space Shuttle Endeavours payload bay for launch May 30 on Mission STS-111 to the International Space Station.The 39th Space Congress held at the Radisson Resort at the Port in Cape Canaveral April 30-May 3 featured a number of special events, including the unveiling of dramatically improved new Hubble Space Telescope imagery. The telescopes camera was upgraded during the most recent servicing mission. A downlink video communication from the International Space Station with the Expedition 4 crew brought the wonder of the Station directly to the conference on its opening day. SPACEPORT NEWS Page 3 May 17, 2002Boeings Doug Thom named Energy ChampionPink Team No. 233 scores big in FIRST World Doug Thom, Boeings Payload Ground Operations Contract energy manager, is leading Kennedy Space Center by example. Thom was selected as this years NASA Energy Champion for the energy awareness campaign, You Have the Power, initiated by the Department of Energys Federal Energy Management Program. Energy Champions who have made extraordinary contributions to the energy savings efforts are recognized by the Department of Energy at all federal installations, said Barbara Naylor, environmental protection specialist and Environmental and Energy Awards Program chair. These men and women have developed and advocated innovative practices which have been saving energy and money and improving the efficiency of the government. They serve as role models for their fellow employees and for all Americans. NASA Headquarters Environmental Management Division asked all NASA centers to nominate candidates for a single slot as NASAs newest Energy Champion. NASA KSC Payloads/Station nominated Thom for saving energy and dollars by aggressively working to improve the efficiency of operations and maintenance practices. Thom is helping NASA avoid 20 billion British Thermal Units and $350,000 in energy costs. The DOE program will feature Thoms photo and accomplishments on posters for distribution across NASA centers. KSC employees had the chance for a sneak peak of the poster at the 2002 Energy and Environmental Awareness Week activities. I am honored to be selected as NASAs Energy Champion. Energy conservation does not have to be painful or costly. Boeings energy conservation team strives to operate only what is necessary, only when it is needed, at the highest level of efficiency possible. Often times all that is required to substantially reduce energy consumption and costs are procedural changes and challenges to the way weve always done things in the past, said Thom. Our behind the scenes workforce of maintenance technicians, mechanics, electricians, and engineers are really the individuals who have the power to conserve energy at very low expense. There is much work left to be done to meet our Federal mandated energy reduction goals. Much of the low hanging fruit has already been picked. Along with details on the program and previous Energy Champions, Thoms information and poster will soon be available at the FEMP web site: http:// www.eren.doe.gov/femp/yhtp/ nasa.html.Doug Thom is featured as Energy Champion on a Department of Energy poster that will be distributed across NASA centers. No. 233 team members Megan Robertson and Peter Martin take a break at the regional competition.A Kennedy Space Centersponsored team, No. 233, took the FIRST World Championship by storm, winning several honors, including tying for third top team in the world. The For Inspiration and Recognition of Science and Technology (FIRST) robotics competition, featuring the top 290 of 650 teams across the world, was held April 2527 at EPCOT Center in Orlando. Team No. 233, the Pink Team, attended the KSC regional at KSC Visitor Complex March 7-9 and fared well, then attended the Canadian regional and rose to the first seed position. The high school team shined even brighter at the world competition, taking home a top prize as well as a number of other honors: Archimedes division champion, incredible play, leadership in control and ten other team awards. We learned something in each match and continually improved both our vehicle and our strategy, said Andy Bradley of KSCs Electrical and Electronics Engineering Branch, who mentored the team. The intent of this whole event is to inspire young people to get involved with science and technology, and to help make our world a better place through innovation. As I look into the eyes of our student members, it seems clear that we have accomplished that goal many times over. The Spaceport Engineering and Technology Directorates Development Integration Lab, known as the Prototype Shop, has been supporting FIRST teams for many years. Team No. 233s performance this year is particularly rewarding because the lab member who started and continued to drive the mentoring effort, Ron Fox, passed away in December, said NASAs John Poppert, who leads the lab. They all went out there to win one for Ron and they did it, Poppert said.Before their most recent success at the FIRST World Championship, the Pink Team competed at the FIRST regional competition at Kennedy Space Center Visitor Complex. Pictured from left are Nong Onvathanasin, Andy Lieb, Kennedy Space Center mentor Andy Bradley, and Ben Hanzl. SPACEPORT NEWS May 17, 2002 Page 5Students enjoy Space Day and moreEducation events heat up as summer approachesKennedy Space Centers Education Programs and University Research Division is beginning the school-free season with a continuous flow of activities. We are proud to be kicking off our summer season with several very exciting programs for students, educators and NASA employees. The first of these are National Space Day, Space in the Classroom, and the Educator Resource Center Network/Education Technology Program Joint Conference,  said Pam Biegert, KSCs Education Programs and University Research Division chief. National Space Day brought more than 400 children in school groups to the Kennedy Space Center Visitor Complex (KSCVC) on May 2. JoAnn Morgan, External Relations and Business Development director, welcomed the students from grades 3 to 12. The group then watched the brand-new 3-D IMAX Space Station movie narrated by Tom Cruise, interviewed former-astronaut Story Musgrave, participated in a live webcast and watched in awe as Exploration Station experiments were performed in the Universe Theater. KSC also supported the Orlando Science Centers celebration of National Space Day by sending education personnel and exhibits of KSC-unique products and materials for the students to see and touch. The Florida Space Authority sponsored the Space Foundations Space in the Classroom (SITC) educational conference from May 2-4 at KSC. The hands-on conference for K-12 educators explored teaching with space and offers optional graduate credit. Along with a KSC tour, educators learned science concepts and experienced them first hand in a real life environment. For more information on SITC, visit www.spacefoundation.org The Educational Technology Program (ETP) and National Educators Resource Center Network (ERCN) Conference began at the KSCVC on May 7. After the kickoff in the Universe Theater hosted by Morgan and Steve Dutzcak, KSCs Pre-College Programs lead, the participants headed to the Center for Space Education building for the ERC Open House. This allowed the participants a close look at the facility. Later in the week, Science Education Director STS-109 astronauts visit with KSC workersAstronaut Story Musgrave visits with students at Kennedy Space Center Visitor Complex during National Space Day May 2. The day was just one of a number of educational events held by KSC.for Life Sciences Tom Dreschel presented a Fundamental Biology Program workshop. The workshop focused on Space Shuttle Mission STS-107. The workshops goal was to inform participants about educational/outreach materials and programs that will be available related to STS-107 as well as familiarize them with the science that will be performed. The division will be offering learning opportunities all summer, including internship and apprenticeship programs, motivational speakers, mentor training, and the May 14-15 MarsPort Engineering Design Student Competition. Details about KSCs education programs can be found at www-pao.ksc.nasa.gov/kscpao/ educate/edu.htm .Members of the STS-109 crew sign autographs for Kennedy Space Center workers in the KSC Training Auditorium May 3. Before the signing, the crew showed their mission highlights tape and talked with employees about their mission to service the Hubble Space Telescope. May 17, 2002 SPACEPORT NEWS Page 6SPACE ...(Continued from Page 1)Technology Training Center opens at KSCVC At the opening ceremony for SABRE, Space Agricultural Biotechnology Research and Education, April 29, key participants gather around the SABRE poster. From left are Robert Ferl, professor in the horticultural sciences department and assistant director of the University of Florida Biotechnology Program, who will direct and be responsible for coordinating the research and education; William Knott, senior scientist in the NASA biological sciences office; U.S. Representative Dave Weldon; Center Director Roy Bridges Jr.; and Florida Representative Bob Allen. JoAnn Morgan, External Relations and Business Development director, addresses attendees of the Technology Training Center ribbon-cutting May 3 at the Center for Space Education at the Kennedy Space Center Visitor Complex. The new center will be used for Brevard Community Colleges aerospace degree program. The $1 million program is funded through state grants and cash and in-kind contributions from aerospace companies. Kennedy Space Center Director Roy Bridges Jr., fourth from left, and others attend a briefing on hydrogen research at the Florida Solar Energy Center (FSEC) in Cocoa. NASA recently awarded the center, a research institute of the University of Central Florida, a hydrogen research grant of $5.425 million. The FSEC has long been recognized for its excellence in hydrogen research. In 1983, NASA KSC funded the first hydrogen work at FSEC. The new hydrogen research program will be co-managed by Glenn Research Center and KSC.Brevard Community College aerospace students and the space program will benefit from a new addition to the Center for Space Education at the Kennedy Space Center Vistor Complex. A new 3,000-square-foot Technology Training Center was added to give students more than twice the room they had for BCCs twoyear aerospace degree program. The ribbon-cutting for the new facility was held May 3. Featured speakers at the event were U.S. Representative Dave Weldon and BCC President Thomas Gamble. BCC will rent the space from the Astronauts Memorial Foundation. The foundation is a not-for-profit organization that honors astronauts who sacrificed their lives for the nation and the space program. The theme of the conference was Beginning a New Era: Initiatives in Space. The exhibit hall featured exhibits from more than 30 space companies and government agencies. Panel and paper sessions by international and national space program leaders and representatives from Kennedy Space Center and the 45th Space Wing explored issues facing the space industry. Hot topics included exploration initiatives, spaceport infrastructure and cutting-edge technologies. A session on Floridas role in space research was especially timely as it highlighted several NASA-KSC partnerships with state universities that have recently made news. The SABRE, Space Agricultural Biotechnology Research and Education, program was described by Robert Ferl, professor in the horticultural sciences department and assistant director of the University of Florida Biotechnology Program. Ferl will direct and be responsible for coordinating program research and education. Involving UF and NASA, SABRE will focus on the discovery, development and application of the biological aspects of advanced life support strategies. The program will include faculty from UFs Institute of Food and Agricultural Sciences, who will be located at both KSC  in the stateowned Space Experiment Research and Processing Laboratory (SERPL) being built there  and UF in Gainesville. NASAs partnership with the University of Central Floridas Florida Solar Energy Center (FSEC) was also discussed. The center has been awarded a hydrogen research grant of $5.425 million from NASA Glenn Research Center. The program was developed to support NASAs Space Launch Initiative and Kennedy Space Centers Spaceport of the Future plans. The 18-month research effort will be co-managed by Glenn and KSC. Research will be conducted by the Solar Energy Center and other universities within the State University System of Florida. FSEC has a strong technical research staff and resources based on its long-standing hydrogen energy research programs supported by the U.S. DOE and NASA. Some of the worlds leading expertise in hydrogen storage and utilization are at KSC, and KSCs programs make it a natural test bed for evaluating new hydrogen systems and applications. Page 7 SPACEPORT NEWS May 17, 2002 Prepare now for hurricane season Boeing Rocketdyne wins SSME contractSLI completes milestone reviewNASA has awarded a $1.14 billion contract to the Rocketdyne Propulsion & Power unit of the Boeing Co., Canoga Park, Calif., for maintenance and support of the Space Shuttle Main Engine (SSME) for the next five years. The contract calls for Rocketdyne to support the Space Shuttle flight manifest. Support includes on-going flight and test engineering, as well as engine refurbishment. The contract requires the manufacture, assembly, test and delivery of three additional SSMEs. The contract also provides engineering support to both Main Engine processing at NASA's Kennedy Space Center and Main Engine test firing at NASA's John C. Stennis Space Center, Miss., as well as engine design, manufacturing and engineering management at the Rocketdyne facility. NASA is another step closer to defining the next-generation reusable space transportation system and successor to the Space Shuttle. The Space Launch Initiative (SLI), a NASAwide effort defining the future of human space flight, has completed its first milestone review  resulting in a narrower field of potential candidates for the nations second-generation reusable space transportation system. To use the resources afforded by space, its critical to increase reliability and safety while at the same time reducing the cost of space transportation, said Art Stephenson, director of NASAs Marshall Space Flight Center, Huntsville, Ala., which manages the SLI for the Office of Aerospace Technology. The recent review, called the Initial Architecture Technology Review, analyzed and evaluated competing second-generation reusable space transportation architectures and technologies against NASA and commercial mission requirements, as well as safety and cost goals. Architecture refers to the complete transportation system design  that is, the vehicles and their components that fly into space, as well as the ground operations needed for launch. The transportation system design includes an Earth-to-orbit reusable launch vehicle; on-orbit transfer vehicles and upper stages to put satellites into orbits; mission planning; ground and flight operations; and support infrastructure, both on orbit and on the ground. Three contractor architecture teams (The Boeing Co. of Seal Beach, Calif.; Lockheed Martin Corp. of Denver; and a team including Orbital Sciences Corp. of Dulles, Va., and Northrop Grumman of El Segundo, Calif.) presented dozens of potential architectures for review. Following the review, each retained a handful of possible candidates for the nextgeneration reusable space launch system. All NASAs field centers and the Air Force Research Laboratory are actively participating in the SLI. Additional information, including a list of the selected contractors, is available on the Internet at: http://www.slinews.com and http:// www.spacetransportation.com. NASA Kennedy Space Center Headquarters Building is completely underwater. The barrier islands are washing away. The ocean is 25 feet above sea level, with 20-foot waves, and a 180-mph wind is howling. This scenario could happen if a Category 5 hurricane made landfall just south of KSC. Fortunately, this event is extremely unlikely. Since 1871, no major hurricane (Category-3 or higher, 131 mph or higher) has made landfall on the central Florida Atlantic coast, although many have made close approaches. But remember, as the people at Homestead Air Force Base discovered in 1992 with Hurricane Andrew, it only takes one. Even a weaker Category 1 or 2 storm with winds of up to 110 mph can ruin your whole day, especially if you live or work on a barrier island. The official hurricane season is June 1 through November 30. Now is the time to prepare and update your hurricane plans. Ask yourself: Where will I evacuate? What do I need for my hurricane kit? How will I keep informed on the weather? Who do I need to inform when I evacuate? How will I care for my pets? Should I get a weather alert radio? And many other questions. The importance of being prepared cannot be overemphasized. The day before landfall is the wrong time to fight the crowds at the stores, just to find out the materials you need are sold-out. If you think the Christmas shopping rush is crowded, wait until you see the day before a hurricane. As with all management issues, the key is to plan your work, and work your plan! The experts are predicting another season of above average hurricane activity. The latest prediction from Dr. Gray at Colorado State University, the nations leading hurricane season predictor, is for a season 25 percent above normal. Dr. Gray is predicting 12 named storms (tropical storm strength or greater), 7 hurricanes, and 3 major hurricanes (Category-3 or greater). The more storms, the greater the chance one of them will affect you. Are you ready to evacuate if necessary? Remember, you must finish all your outdoor work before tropical storm winds arrive (39 mph). Otherwise it becomes too dangerous to work outside. You can save you and your family a lot of grief by being well prepared and ready to evacuate immediately when the evacuation is announced. Beating the tidal wave of traffic leaving the coast will save you considerable frustration driving and increase the chances of finding an in-land hotel, if thats your plan. Old hands know to scout out several hotels at several locations and call days ahead for reservations when hurricanes threaten, then cancel the reservation if not needed. Further information or hurricane preparedness training is available from the KSC Emergency Preparedness Office, (321) 853-6861, and 45th Weather Squadron, (321) 853-8410. Information on what you need to do to be prepared is at the following Web sites: 45th Weather Squadron, https://www.patrick. af.mil/45og/45ws ; KSC Emergency Preparedness, http://sgs.ksc.nasa.gov/sgs/sites/other/ emergency_prep/index.htm ; National Weather Service in Melbourne, www.srh.noaa.gov/MLB ; National Hurricane Center, www.nhc.noaa.gov ; Federal Emergency Management Agency, www.fema.gov/fema/trop.htm ; American Red Cross, www.redcross. or ghttp://chapters. redcross.org/fl/brevard ; and Brevard County Emergency Management, http://embrevard.com. Page 8 SPACEPORT NEWS May 17, 2002 John F. Kennedy Space Center Managing editor. . . . . . . . . . . . . . . . . . . Bruce Buckingham Editor. . . . . . . . . . . . . . . . . . . . . . . . . . Kathy Hagood Editorial support provided by InDyne Inc. Writers Group. NASA at KSC is located on the Internet at http://www.ksc.nasa.gov USGPO: 733-133/60008Spaceport News Spaceport News is an official publication of the Kennedy Space Center and is published on alternate Fridays by External Relations and Business Development in the interest of KSC civil service and contractor employees. Contributions are welcome and should be submitted two weeks before publication to the Media Services Branch, XAE-1. E-mail submissions can be sent to Katharine.Hagood-1@ksc.nasa.govEnvironmental and Energy Awareness Week draws interest NASAs latest Earth observing satellite, Aqua, successfully launches aboard a Delta II rocket at 2:55 a.m. PDT. Aqua is dedicated to advancing our understanding of Earths water cycle and our environment. Launching the Aqua spacecraft marks a major milestone in support of NASAs mission to help us better understand and protect our planet. The Aqua spacecraft lifted off from the Western Test Range of Vandenberg Air Force Base, Calif. Spacecraft separation occurred at 3:54 a.m. PDT, inserting Aqua into a 438-mile orbit.Aqua heads skywardField trips, demonstrations and presentations may sound like all fun, but the 2002 Environmental and Energy Awareness Week (EEAW) was definitely educational as well. The festivities began on Earth Day, April 22, and continued until April 24. To start the activity-packed week, David Struhs, Florida Department of Environmental Protection secretary, spoke to a filled Training Auditorium. Struhs discussed everything from the first Earth Day to the ironic fact that environment management evolved at the same time the space program began and how the two are still co-dependent. Were unleashing new technology to save nature, said Struhs, who leads Gov. Jeb Bushs Florida Forever plan. The Kennedy Space Center workforce is definitely leading the way in Balancing Nature and Technology  the 2002 theme. To end the ceremony, SGS President Mike Butchko presented Energy Eagle Awards to David Hall, David Lambert, Andy Anderson, Freddie Furman and John Martin for their innovative energy and cost-saving concepts. A kickoff ceremony was held on the Headquarters Building front lawn April 23 to recognize employees who contribute to KSCs environment and energy savings on a daily basis. Shannah Trout, from Dynamac, was awarded for her slogan, Balancing Technology and Nature. Kandy Warren, External Relations and Business Development public affairs specialist, also was awarded for her water slogan, One small drop for KSC  one giant lake for mankind. For his outstanding energy leadership role, Dave Koval also received an award and recognition. Diane Callier, Environmental Program Branch chief, then encouraged attendants to participate in all EEAWs offerings, after expressing her gratitude for everyones hard work. Im always impressed with all we do to protect KSCs unique environment, said Callier. Not only were booths manned to distribute everything from posters to literature on indoor air quality at the workplace and irrigation practices, but participants could also take part in interactive events. A field trip was offered to visit a thriving scrub jay colony, which coexists in the shadow of the Shuttle. Spectators could see the latest in automobile technology  alternative fueled vehicles Danielle Stern, from the Brevard County Regional Stormwater Utility Department, educated employees on stormwater runoff  the states leading source of water pollution. Representatives from the Aquatics Program explained their role at KSC and how they monitor things such as sea turtle nesting, animal strandings and water quality.Workers visit information booths during Environmental and Energy Awareness Week at Kennedy Space Center.